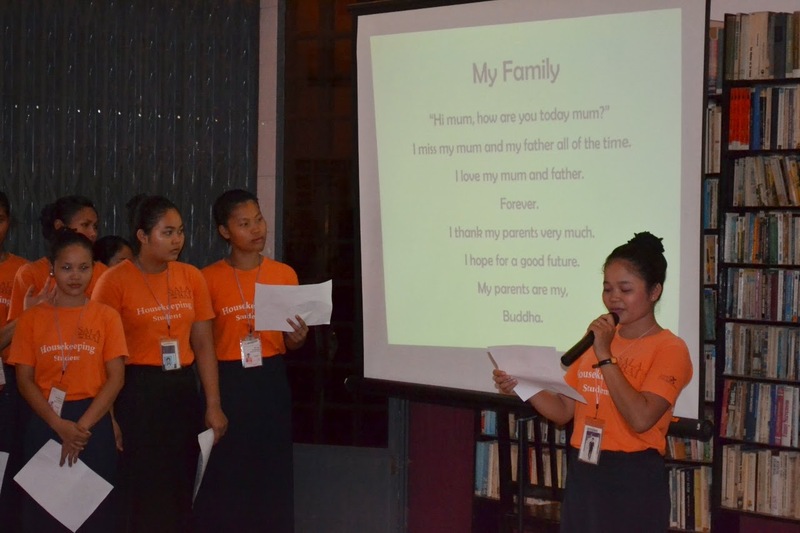 Writing Through Cambodia is a programme using creative writing to improve Cambodian students’ fluency in English, both spoken and written, to develop their capacity for conceptual thought, and to enhance their self-esteem. It also works with Cambodian teachers. Writing Through Cambodia was founded by Sue Guiney, an American-born, British-resident poet, novelist and educator. When she is not volunteering with Writing Through Cambodia, Jeanne McKay is a conservation biologist living in Singapore, from where she manages a conservation research project in Sumatra, Indonesia. 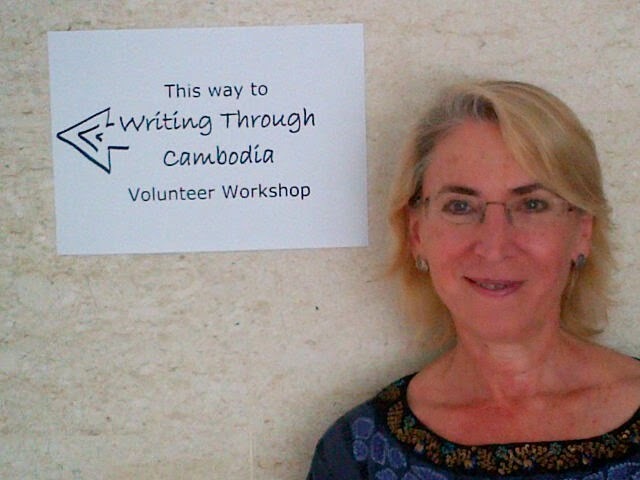 Jeanne and Sue collaborated on a guest post exploring the role of Writing Through Cambodia. It is not very often that an opportunity comes along which enables me to do everything I love all at once; working with young people, experiencing a new culture, and writing - creative writing. My recent trip to Cambodia as a programme facilitator combined all of these things - and more. The mission of Writing Through is to help improve the conceptual thinking skills and self-esteem of at-risk students. I met its dynamic founder, author Sue Guiney, a few months previously at a one-day training workshop she gave in Singapore for a small group of potential volunteers. The goal was that we would put into practice her inspired teaching methodologies, “somewhere in Cambodia, sometime in the future, and whenever opportunities arose”. I was hooked. Now, I have never been to Cambodia, nor did I feel exactly prepared to run a week-long creative writing workshop after one day of training, but when the call for volunteers came out a few weeks later, I may well have set a world record for the fastest email. Sometimes you just know, and you have to go with it. A few months later, my plane touched down in Siem Reap which is located in north western Cambodia, the centre of the Khmer region. With a few rare days to myself, I got up at dawn to see the sunrise at the magnificent Angkor Wat and visited one of the famous floating villages by motor boat, perused the night markets and sampled the delicious local fare from the classic fish amok to crocodile meat (which incidentally tasted like chicken and fish). I tippled at the sultry Miss Wong’s bar, frequented the numerous fresh tropical juice kiosks, explored the local markets and several more fascinating temples: Tah Prom, Bayon and Preah Kan. On my last day, I received a blessing from a monk for good fortune during the week ahead at Sala Bai. Sala Bai, also known as the School of Rice, is a hotel and restaurant school founded in 2002 by the French NGO Agir pour le Cambodge. Every year it trains roughly 100 students from the most rural areas in Cambodia in the hospitality industry and finds employment for every single one of its graduates within three months - a remarkable achievement. Having stayed there, I know it is more than just a school and a hotel, it imparts a feeling of home which extends not only to its students but also to its guests. I was given a large cohort from their housekeeping division and because their duties were largely conducted behind the scenes, they did not have much opportunity to interact with guests or practice their very limited English language skills. Waiting for my translator to arrive, I looked out at the eleven nervous and expectant faces before me and said rather awkwardly in my 3 day old Khmer, “Hello and welcome, my name is Jeanne.” Silence. Then to my relief, there was laughter and huge applause. Our creative, 5 day journey together could now begin. We utilised Sue’s inspired teaching methodologies which include the distribution of magic pencils (to be used only for creative writing) and just four rules: 1) Don’t think! 2) Use the back of your brain 3) Write with your ears and 4) Know you cannot make a mistake. We explored the theme of home and hospitality, and what that meant to the students and the guests that stayed there. 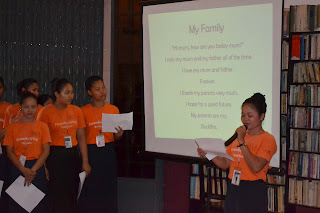 Incredibly, the first day produced a group poem, the second day individual poems, the third, a group story and by the fourth day, each student had written their own story. The fifth and final day we focused on reading in front of an audience, phonetics and final editing of all written work in order to produce a final publication, called The Magic Pencil. That same night, Sala Bai hosted the final requirement of the programme, A Big Event, which allows the students to present their work to an audience including their teachers, peers and anyone else who wishes to attend. I watched with an incredible amount of pride and inspiration as the eleven shy students whom I had met only five days earlier stood up in front of a large audience, and with microphone in hand, read - in English - their works. I have had the privilege to live and work in nine countries and travel to numerous others and in my opinion, there are few opportunities which are as inspiring as this one. Perhaps it was the combination of two amazing initiatives experienced at once, but I am certain that when the Writing Through call comes again, I will have one foot out the door and one hand on my magic pencil. Jeanne has voiced so eloquently what we do and how we do it that I find there isn't much left to add. The seeds of Writing Through were planted seven years ago after my own first trip to Cambodia as a volunteer tourist. I am a novelist and poet, and that experience so inspired me that I am now writing a collection of novels portraying for English readers life in Cambodia today. But the more I learned, the more I loved and the more committed I became to bringing the powers of language and voice to those unable to express themselves. Understanding what you think and knowing how to express it confidently is not innate. It has to be taught and encouraged, and that is what the Writing Through workshops do. I started them in one shelter in Siem Reap and they are now held in schools and NGO's throughout the country. Next year, we expand into other countries, too. Clearly, there is a need, and it is the privilege of my life to help fulfil that need. Join us.